I was at the flea market with my friend DoctorC yesterday and we came upon a Japanese kid selling all these import lanyards and keychains. He had a bunch of fighting game character keychains and I got stoked when I saw a Sakura keychain... until I saw a Nakoruru keychain. He said something to the effect of "You're picking Nakoruru over Sakura?" I casually replied that I've switched sides and am now a full blown SNK fan and that Capcom is almost dead to me. I thought everyone knew how I felt, but he seemed surprised (and outraged). I'm going to try and explain what happened, but you may be able to guess the reasons. NOTE - This post is entirely based on fighting games. Capcom has other non fighting games that are superb, I just don't care about them as much. Back in the day I loved both companies quite a bit, but I always liked Capcom slightly better. Until recently. "It is true that for the versus fighting the majority can be played on line on console, but we want to preserve this aspect of the versus fighting where the players can clash in truth on terminals. Before offering a version comforts we preferred privileged the players of arcade." Capcom has completely sold out in the style department when it comes to fighting games. Street Fighter 4 and Marvel VS Capcom 3 both look completely ridiculous in my opinion. Capcom is clearly moving all of their fighting game style to a 3D, polygon/cel shading based style that looks terrible. Street Fighter is their flagship and I'm ok with them doing whatever they want with it, even if it is disappointing, but then they went and did it AGAIN with Marvel VS Capcom 3 and I don't think there's any end in sight. I'll be amazed if Capcom ever releases a new 2D hand drawn sprite based fighting game again. Consider this screenshot from the upcoming straight to console Street Fighter X Tekken. 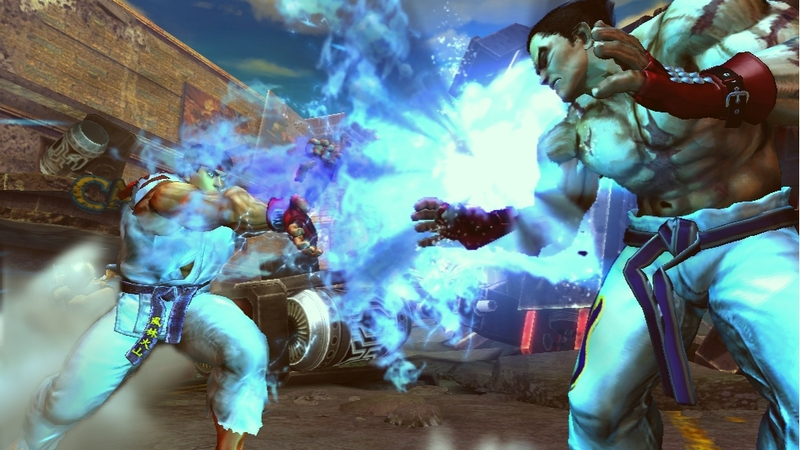 Ryu's Hadoken looks suspiciously like Sailor Mercury doing her Mercury Bubbles Blast. Looks pretty silly. Now look how amazing hand drawn sprite based characters can look with modern technology. our small presence is relegated to maybe a few shopping centers / arcades. fan base will agree with that, and that it will probably increase." While SNK fighters still require a great level of skill to master, the games Capcom has been pumping out are ridiculously easy to play and don't require a lot of thought. The first time I played MvC3 at a friends house I button mashed my way through it and beat Galactus on the hardest difficulty setting on my very first attempt. The game has one button supers for cryin' out loud. Just sayin'. Overall I just feel that SNK Playmore cares more about the fans that have cared about them for all these years than Capcom does. I'm just not feeling the love from Capcom as much anymore. I still like them, but I'm not liking the direction they are going. I'm probably just getting old and resisting change like people do when they get older, but it's how I feel. If you want to learn more about SNK check out Neo-Geo.com. Also listen to this wonderful episode of AllGenGamers Podcast about SNK. It's extremely good.